The dream of a simpler, natural life speaks to a deep place in all of us. Modern-day homesteading is both an embrace of the past and a revolutionary act for the future. Urban and suburban life can feel shallow and disconnected. Learning to live with the land in our homesteading classes brings meaning, purpose and empowerment. Only a few generations ago, most people grew up in roughly the same place as their great-grandparents. Back then, children learned from older family members how to contribute skillfully to the homestead. But nowadays, things are a bit different. Few of us were raised with extended family around. It’s common for children to focus on book learning at school; they may never wield a shovel, hoe or hammer as part of their education. But that doesn’t mean we can’t, as adults, renew our relationships with self sufficiency. Our homesteading classes grew out of a love for practical skills and the desire to make learning these skills accessible in a culture that has virtually abandoned them. We are here to welcome you back to your roots and to build a sustainable future together. 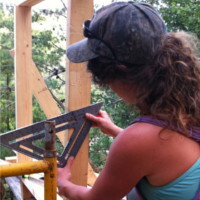 You may wonder what sorts of skills you need to live your dream of a self-sufficient homestead? Our instructors have been experimenting with this vision for decades. You can learn a lot from their experience in our homesteading classes. As a result you’ll be able to get started with your own project on solid footing. We believe that permaculture design and principles are incredibly useful tools when it comes to homesteading. Our traditional, 11-day Permaculture Design Course teaches them through lots of hands-on learning, site visits and a theoretical foundation. 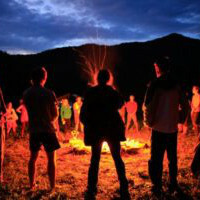 In our experience living with the land, permaculture and earthskills enrich one another. This is why we also offer an intensive Permaculture Design Certificate Immersion with more than 100 additional hours of instruction, focused on Earth-based skills and rewilding. Getting to know the plants around you is important for every homesteader. We are out-of-the-closet plant nerds. Botanical education works its way into all of our homesteading classes. Every year in the early spring, we get out on the trail to learn about edible plants in North Carolina over a long weekend. This is not only a great opportunity to learn foraging in the field, but it’s an awesome way to get to know Wild Abundance and what we do. If the green world is what draws you most, we also offer an wildcrafting class where you’ll learn all about wildcrafting and making medicines from healing plants. 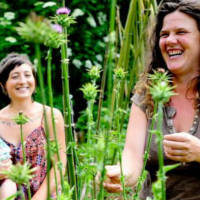 Both of our permaculture courses go deep into both wild and cultivated plant allies, too. Our gardening apprenticeship takes things a step further. 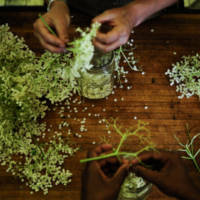 Of all our homesteading classes, it provides the most hands-on experience with plants in the fields, woods, and garden. Everyone needs carpentry and building skills. Whether you hope to build your own home, renovate one, or just do your own maintenance and repairs, learning carpentry is important. One of our homesteading classes is a tiny house workshop that covers so much more than the basics. It’s 8 full days long and weaves in natural and sustainable materials, along with design and traditional building skills. 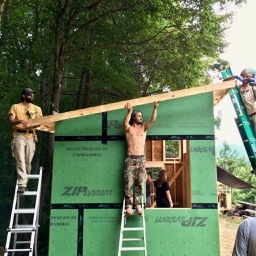 The course is just one aspect of our tiny house apprenticeship, which includes room and board, plus individualized guidance in building, permaculture and just about everything we do here. 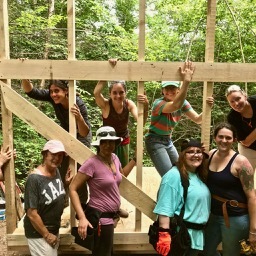 For female-bodied people who may not feel comfortable with hand and power tools yet, our women’s carpentry course will get you up to speed. We offer two levels: basic and advanced. The difference is that we dive into structural building in the advanced class. Homesteading is all about being resourceful. That means learning how to use what you have at hand. When your homestead includes raising livestock and/or hunting, the knowledge of how to use the whole animal is crucial. That’s why we teach you how to tan a hide so that you can make the best quality leather right on your homestead. You can see that our homesteading classes cover both the macro and the micro levels of sustainable living. As a result, we provide you with the skills you need to make your dreams a reality.